Modern elephants are cool. Mammoths are really cool. Deinotherium is really, really cool! What makes Deinotherium cooler than all the other elephants? His amazing body can hardly be limited to one feature so there are a few answers to that question. 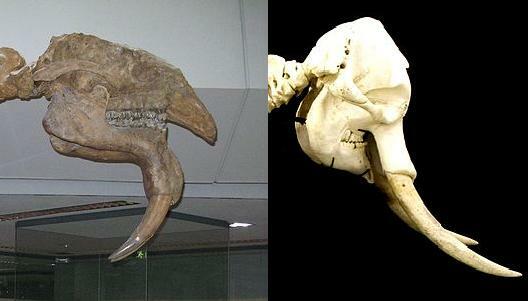 As can be seen in the picture to your left, there are a great many differences between the grade of Deinotherium’s (left) head and a modern elephants (right). The high-steep slope of the elephant puts the flat shape of the Deinotherium into perspective. However, where Deinotherium lacks in slope he gains up in trunk. Because his nasal opening is quite large it can be assumed that he had a strong trunk. This was very important in finding food. As you can tell from the picture on the right Deinotherium had tusks that were in a very odd arrangement . . . backwards. However, maybe today’s elephants are backwards and Deinotherium is the one with them pointing the right way. Who’s to decide? Other theories state the tusks were used to strip bark from trees. Or maybe they were used to break down branches so Deinotherium could get easier access to the branches and less struggle. The battle about how they were used can only truly be answered when we finally meet one of these amazing creatures. It is actually very likely Deinotherium used his tusks for all of the above and more. Another unique thing about Deinotherium’s tusks are the fact that they protrude from the lower jaw and that he has no upper tusks. 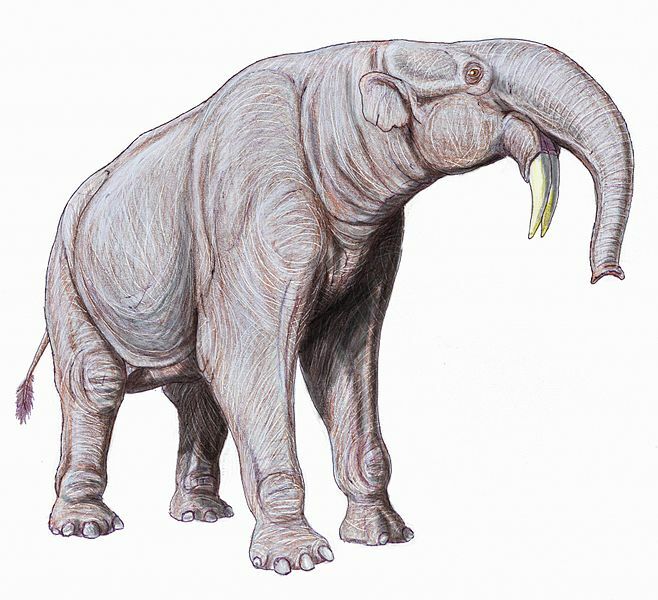 Modern elephants have their tusks attached to their upper jaw. This isn’t the case with unique Deinotherium. Without even mentioning the incredible size of Deinotherium (11-12 feet at shoulder . . . okay, now we mentioned it) we have described a creature that was incredibly designed and crafted that still has scientists and laymen excited.